me $50.00 for a birth-day present. I am 50 years old today. It is too hot to work, but after I came home from town Ida and I washed some. Charlie began painting the buggy this afternoon but was called away to help put out fire over by the pasture. 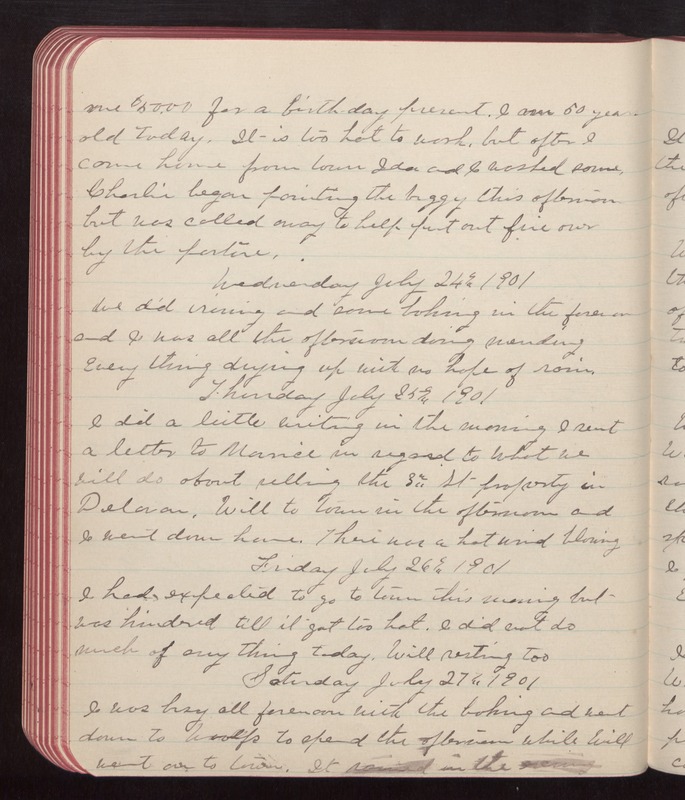 Wednesday July 24th 1901 We did ironing and some baking in the forenoon and I was all the afternoon doing mending Every thing drying up with no hope of rain. Thursday July 25th 1901 I did a little writing in the morning I sent a letter to Maurice in regard to what we will do about selling the 3rd St property in Delavan. Will to town in the afternoon and I went down home. There was a hot wind blowing Friday July 26th 1901 I had expected to go to town this evening but was hindered till it got too hot. I did not do much of any thing today. Will resting too Saturday July 27th 1901 I was busy all forenoon with the baking and went down to Woolfs to spend the afternoon while Will went over to town. It rained in the evening.